This artist’s rendering shows a concept for a future NASA mission to Jupiter’s moon Europa in which a spacecraft would make multiple close flybys of the icy Jovian world, thought to contain a global subsurface ocean. Image credit: NASA/JPL-Caltech. 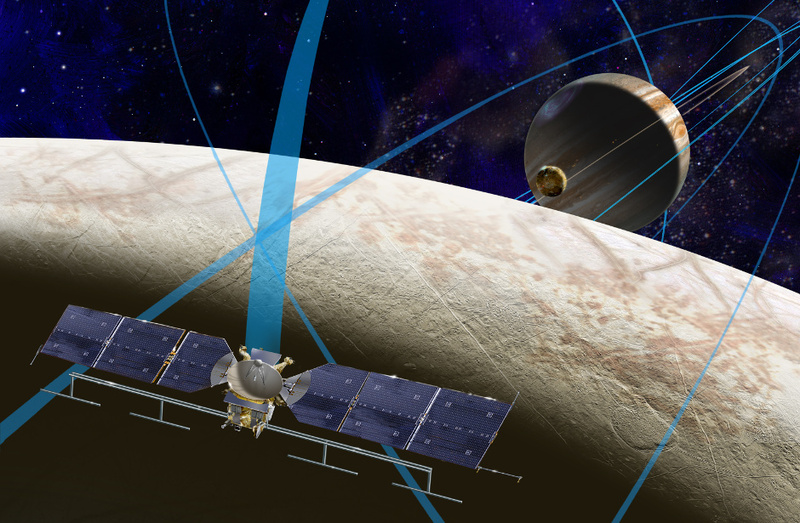 NASA’s fiscal year 2016 budget request includes $30 million to formulate a mission to Europa. 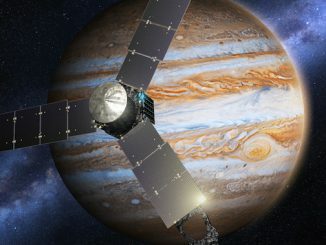 The mission would send a solar-powered spacecraft into a long, looping orbit around the gas giant Jupiter to perform repeated close flybys of Europa over a three-year period. In total, the mission would perform 45 flybys at altitudes ranging from 16 miles to 1,700 miles (25 kilometres to 2,700 kilometres). Bizarre features on Europa’s icy surface suggest a warm interior. This view of the surface of Jupiter’s moon Europa was obtained by NASA’s Galileo mission, and shows a colour image set within a larger mosaic of low-resolution monochrome images. Galileo was able to survey only a small fraction of Europa’s surface in colour at high resolution; a future mission would include a high-resolution imaging capability to capture a much larger part of the moon’s surface. Image credit: NASA/JPL-Caltech. A thermal instrument will scour Europa’s frozen surface in search of recent eruptions of warmer water, while additional instruments will search for evidence of water and tiny particles in the moon’s thin atmosphere. NASA’s Hubble Space Telescope observed water vapour above the south polar region of Europa in 2012, providing the first strong evidence of water plumes. If the plumes’ existence is confirmed — and they’re linked to a subsurface ocean — it will help scientists investigate the chemical makeup of Europa’s potentially habitable environment while minimising the need to drill through layers of ice. Interior Characterisation of Europa using Magnetometry (ICEMAG) — principal investigator Dr. Carol Raymond of NASA’s Jet Propulsion Laboratory (JPL), Pasadena, California. This magnetometer will measure the magnetic field near Europa and – in conjunction with the PIMS instrument – infer the location, thickness and salinity of Europa’s subsurface ocean using multi-frequency electromagnetic sounding. Europa Imaging System (EIS) — principal investigator Dr. Elizabeth Turtle of APL. The wide and narrow angle cameras on this instrument will map most of Europa at 50 metre (164 foot) resolution, and will provide images of areas of Europa’s surface at up to 100 times higher resolution. Radar for Europa Assessment and Sounding: Ocean to Near-surface (REASON) — principal investigator Dr. Donald Blankenship of the University of Texas, Austin. This dual-frequency ice penetrating radar instrument is designed to characterise and sound Europa’s icy crust from the near-surface to the ocean, revealing the hidden structure of Europa’s ice shell and potential water within. SUrface Dust Mass Analyser (SUDA) — principal investigator Dr. Sascha Kempf of the University of Colorado, Boulder. This instrument will measure the composition of small, solid particles ejected from Europa, providing the opportunity to directly sample the surface and potential plumes on low-altitude flybys. The numerous whirlwinds covering Jupiter are caused by upward gas flows originating deep within the giant planet. This is the conclusion reached by scientists at the University of Alberta (Canada) and the Max Planck Institute for Solar Research (MPS) in Germany after extensive computer simulations. 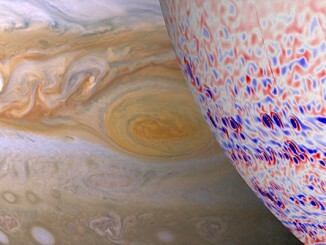 Their models also explain why the Jovian whirlwinds’ direction of rotation is opposite to storms on Earth. 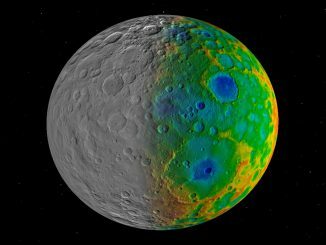 Ceres is covered in countless small, young craters, but none are larger than 175 miles (280 kilometres) in diameter. To scientists, this is a huge mystery, given that the dwarf planet must have been hit by numerous large asteroids during its 4.5 billion-year lifetime. Where did all the large craters go?